Hot hummingbird action the last few days. Two Allen’s hummers competing for control of the plants outside my studio window. I have now found an absolutely reliable way for animal artists, or anyone else for that matter, to procrastinate. 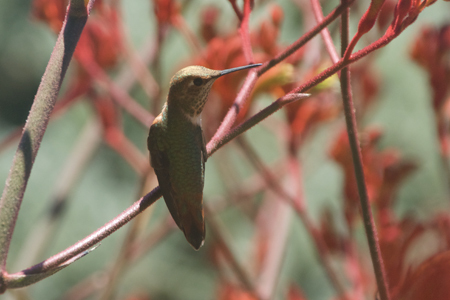 Plant hummingbird-friendly plants right outside the window next to your desk. Wait for that “humming” sound, stop work and watch. Perfect. Outside my studio window is what I call “the tropical garden”. South-facing and it’s where I’m putting all the hot color combinations; red, orange, yellow, lavender, etc. 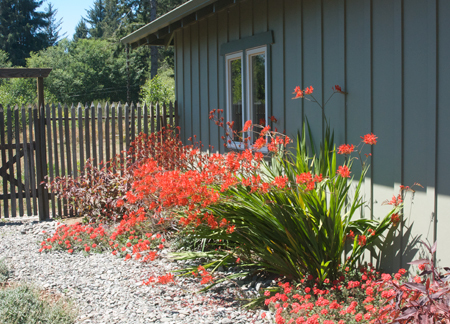 Front to back is red verbena, crocosmia ‘Lucifer’, kangaroo paw and red dragon persicaria. One of the little gladiators. I sometimes think that they are really Rottweilers in bird costumes. 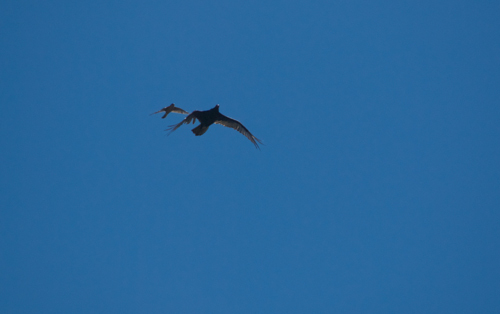 Looked up a few days ago when I was outside and saw what looks like a northern goshawk escorting a turkey vulture, probably away from the nest. I got about six photos. This one reminds me of some I’ve seen in my husband’s aviation books of comparatively tiny American fighter jets “escorting” truly huge Soviet “Bear” bombers. So, to follow up on the source of the Wednesday post title “Pot of Paint”. James McNeil Whistler (of “Whistler’s Mother” fame) had utterly buffaloed the art community in London with what he called his “nocturnes”, impressionistic paintings of night scenes which he showed at a time when the eyes of the public and art critics were conditioned to seeing a high level of detail and what was called “finish”. The leading art reviewer and taste-maker of the Victorian era was John Ruskin, the first prominent critic to champion the Pre-Raphaelites, who never let the vein of a leaf go unpainted if they could help it. In his review of Whistler’s show at the Grosvenor Gallery, then known for showing “advanced” work, Ruskin wrote that he “he never expected to hear a coxcomb ask two hundred guineas for flinging a pot of paint in the public’s face.” So there. Whistler sued for libel. What followed was one of the most celebrated lawsuits of the time. What makes it fascinating and relevant even today is that it turned into a monumental struggle between two very different philosophies concerning the creation of art. Ruskin represented the establishment view that art had a duty to be beautiful, uplifting and moral. Whistler adamantly insisted that Art had no duty outside itself, in other words, “Art for Art’s Sake”. The trial lasted for eight hours. The jury deliberated for two and, in the end, returned the verdict for Whistler, but only awarded him only one farthing, approximately a quarter of a penny, in damages. Whistler mounted it on his watch fob. The good news was that the verdict saved him from having to pay Ruskin’s court costs, but it left him in debt, albeit with a moral victory. If you would like to know all the delicious, gory details, buy, what else, A Pot of Paint- Aesthetics on Trial in Whistler vs. Ruskin, by Linda Merrill. The debate goes on today, although without the level of consciousness that existed in the Victorian art arena. There has been more than one art show here in Humboldt County through the years that had a painting in it that someone found objectionable. The reason is usually some variation of the un-thought out idea that art is supposed to be beautiful, pretty and not make the viewer uncomfortable. Poppycock. Art has no responsibility other than to express the creativity of the maker. No one has the right to pre-censor what an artist creates or shows. No one has to buy what is produced, but they don’t have the right to demand its removal either. It is this sense of persistent life force back of things which makes the eye see and the hand move in ways that result in true masterpieces. Techniques are thus created as a need. It is thus necessary to work very continuously and very valiantly, and never apologetically. In fact, to be ever on the job so that we may find ourselves there, brush in hand, when the great moment does arrive. Wow, is that sunshine? In Humboldt? Clear blue sky? OMG! What’s going on?